The ZOB is a new location for such kind of events that just opened their doors a couple of weeks ago in Reutlingen, near Tübinger Tor. See you there! We'll have a lot of fun, as usual! ZOB Music Bar, Stadtmauerstr.7, Reutlingen. Chris is playing a small solo unplugged concert in Moscow today! Come and visit it, we will have a great evening.... The location is the HM Hostel Moscow, a great place with enough space for as many people as wish to come. Drinks will be for sale on the venue. Use the links on this website (under the album on the right side) to get directly to the album in one of the shops. 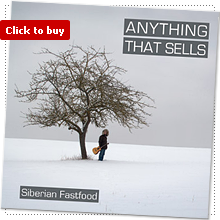 Siberian Fastfood will reveal their debut album "Anything That Sells" with an Album release Party and concert on March 3, 2010 in Bergamo club in Stuttgart.